A Sinn Fein minister has been accused of “making political points” through official government material by adding Irish to a public information website. The claim was made when the NI Direct site, which is used to pay car tax and book vehicle MOTs among other things, was changed to include the title ‘tedireach seirbhísí rialtais’. The change was first reported within hours of outgoing first minister Arlene Foster emphatically stating that she said no interest in agreeing to a Sinn Fein demand for an Irish language act. The NI Direct website is the responsibility of the Department of Finance under Sinn Fein’s Mairtin O Mulleoir. Speaking at the launch of the DUP’s election campaign in Lurgan on Monday, Mrs Foster said it would be more appropriate to introduce a Polish language act as more people in Northern Ireland speak Polish than speak Irish. The ‘te direach’ on the website reflects the Irish for Northern Ireland (Tuaisceart Éireann) and government services (seirbhísí rialtais). The three NI Executive ministries headed by Sinn Fein have traditionally included an Irish translation in the title, but it is understood this is the first time the practise has been adopted for sites such as NI Direct. 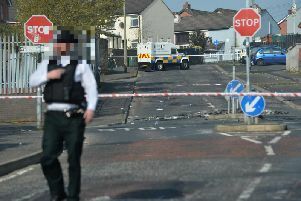 A number of callers contacted the News Letter to claim the change was made shortly after Mrs Foster’s speech in Lurgan. TUV North Antrim Assembly candidate Timothy Gaston was also alerted to the website change. He said: “The additional of Irish to the NI Direct website shows that Sinn Fein are determined to use their places in the government of Northern Ireland both now and in the future to promote their narrow republican agenda. “Coming as it does after O’ Muilleoir used public money to challenge the ban on the use of Irish in our courts, and his ordering of the removal of the Union Flag from a finance ministry building on a designated day, it underscores again that republicans have moved into a new aggressive phase of their ‘struggle’. Mr Gaston added: “It would appear that these changes to the website...were made in direct response to Arlene Foster’s comments on Irish yesterday (Monday). “If this was the case the minister is thumbing his nose at the former co-first Minister and reminding all of us of the power Sinn Fein have to promote Irish by virtue of the fact that the DUP ushered them into government”. Nationalist representatives reacted angrily to Mrs Foster’s comments in rejecting an Irish language act.